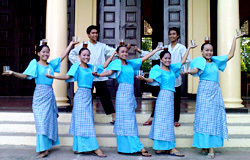 The Bin-I Cultural Group will perform several dances which showcase the unique Filipino culture. The dances would include the Binatbatan – this is an dance depicting the stages of loom weaving, one of the main industries in Ilocos Norte. The dances shows the different stages of making abel a traditional woven cloth from the Capas Sanglay to the finished product. Surtido Banna – is a dance that is performed during festivals. It originated from Banna, a town in Ilocos Norte. Ilocana A Nasudi – this is a dance that depicts the beauty, modesty and grace of the Filipina in general.